I’ve been drawn into the vortex of the Beekeeper’s Quilt from Tiny Owl Knits (Ravelry link). Some Ravelry friends are starting a Beekeeper KAL on September 1st, and we’re planning to swap yarn and/or finished hexipuffs (honeycombs? hexes?). There’s a grocery bag half-full of sock yarn leftovers to use, but they are mostly green, red, and blue. Wullenstudio sells mini skeins of yarn ($4 for 75yds) which I’m planning to get to fill in the gaps in my palette of leftovers. I don’t knit yellow (it makes me look ill), girly pink, grey or brown. We’re also planning a "Sisterhood of the Travelling Skein" (so much nicer than travelling pants) so we can share a skein of yarn across our blankets, and a hexipuff swap. Each piece is lightly stuffed before it’s sewn up, but I think I prefer the unstuffed look. 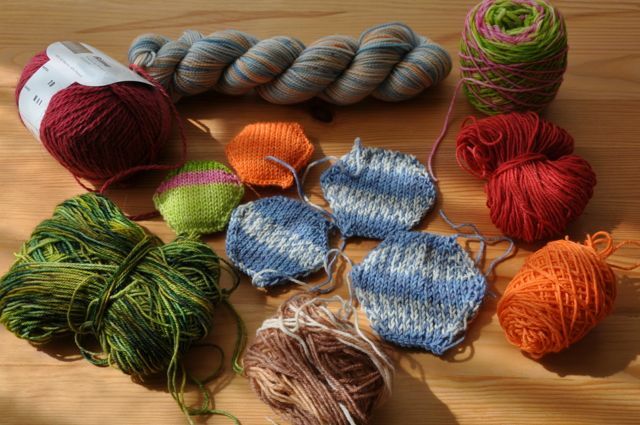 I’ve wanted a sock yarn blanket for a while now and this looks doable. I’m planning on sewing seven hexipuffs at a time to make flower shapes, then sewing those flowers together later. The Beekeeper’s Quilt is a long term project, a 3ft by 4ft blanket requires 384 of them, which is nearly 55 flower shapes. The orange was my first, and the shape feels unsymmetrical with the cast-off corner sticking out. For the second one, the green and pink, I used a US3 needle for the cast-on, and knit with a US4 magic loop. Sadly these were about half the size they should have been, according to the pattern. The cast-on edge looked much better but I wasn’t happy with the cast-off edge, which was a three needle bind-off. The pattern’s crochet bind off looks better. I switched to blue yarn and tried a US6, US7, and finally got gauge on a US8 set of needles, but it looks so loose I think I’ll go back to the US7. Apparently I’m a little tense. If you need more colors, I can donate sock yarn leftovers! Congrats on falling into the sock yarn leftover blanket vortex! I can promise you that it’s a lot of fun!